Bali is an exotic paradise, home to lush tropical jungles and golden sandy beaches stretching as far as the eye can see. Vividly coloured seashells are deposited by glittering waves across soft golden walkways. An utterly idyllic and sumptuous place to unite a couple's love for one another amongst their most loved family and friends. Bali is a sensory overload, Hindu offerings scatter along the ground providing warming aromas from their little woven baskets and the frangipanis overhang the pavements on the streets. Colourful and positively overwhelming, Bali is a tropical paradise that is perfect in so many ways. Across the island there are numerous scenic areas, from hidden beaches with the few most hardened surfers taking on the huge swell…to the most remote, quiet jungle landscapes with a backdrop of cliffs covered in thick vegetation, monkeys swinging overhead in the canopy. Whatever type of landscape you enjoy, Bali has it with wonderful weather to match. Exploring this cultural extravaganza is even more enjoyable due to the friendly people and welcoming atmosphere. In many people's eyes, there is not a place more ideal to be married than a location such as Bali. Several clifftop packages are available that will encapsulate some of your most precious moments together. The Sky Cliff Wedding package and the Hidden Clifftop Wedding package are two that highlight two different areas of this heavenly island. Stepping away from the crowded touristy areas is the Sky Cliff Wedding venue of Bukit Asah. Although a couple of hours drive away from the most densely populated areas, it waves goodbye to overcrowding and allows the discovery of a more authentic Bali. This destination is far more secluded, offering privacy in an incredibly stunning venue. 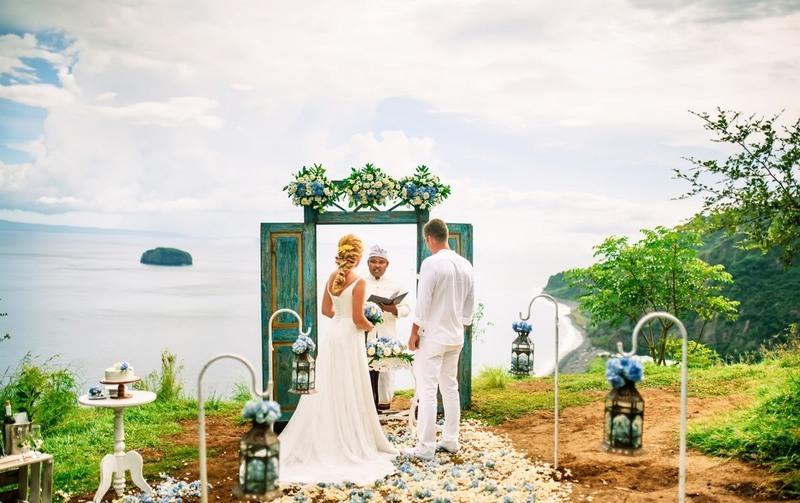 The backdrop of the expansive Indian ocean upon a lush green cliff top will have even the most experienced traveler in awe and allows your wedding party to be engulfed by the natural beauty Bali has to offer. This cliff is based in the Western part of Bali Island, which is home to some of the most breathtaking scenery. This cliff top wedding venue is one of a kind, with views onto the peak of the Agung volcano. Bukit Asah has not only the glistening ocean to be marveled at but also the mixture of cliffs and varying coloured sand beaches. Due to all these elements many have compared it to Hawaii. If this doesn’t entice you enough, you have the Indian ocean lapping below the cliff and Karangasem’s jagged and somewhat imposing cliffs will leave you and your partner mesmerized. Photo opportunities can be had not only from the top of the cliff but also at the base of Virgin Beach, allowing you to capture the beauty of your day (not to mention the nature around you). The contrasting colors make for some of the best wedding photos, leaving all those envious of this secret spot. 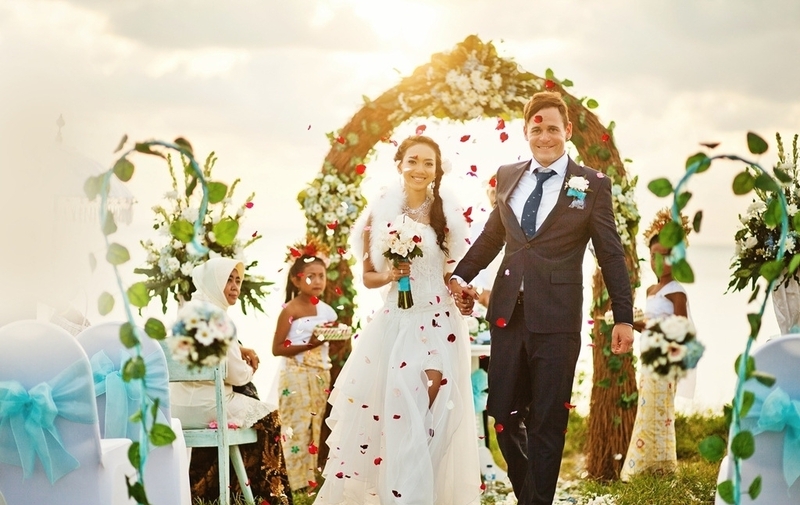 When you have your Bali cliff wedding here, you won’t have anything else burdening your mind. Another impressive option for those looking for utter luxury is the Hidden Cliff Wedding Package. Ideal if you also want to take a step away from typical beach style ceremonies. Dramatic scenery here is what you can expect, nothing run on the mill. Just imagine the sound of heavy waves tumbling below your feet and a multitude of inky colours merging into the horizon as the sun prepares to set. 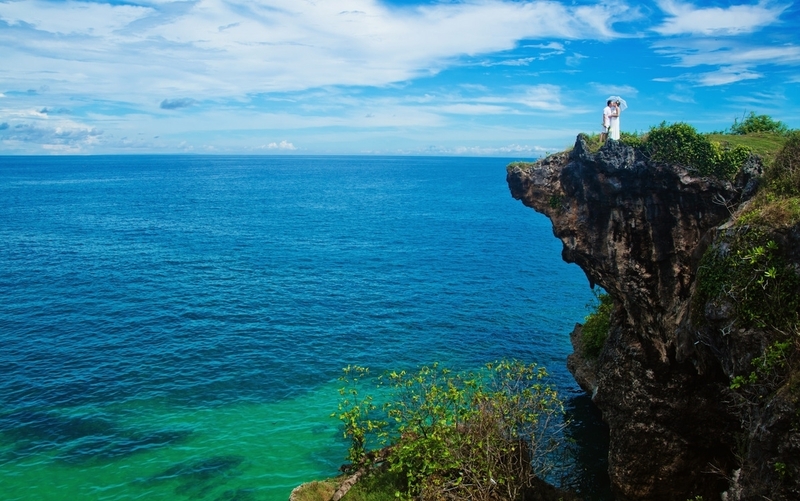 That is what you can expect with a hidden cliff Bali wedding. Balian Cliff is the destination for the Hidden Cliff wedding. It is located on the land of a privately owned villa, thus enabling you to have an intimate wedding. Spoil yourself, your family and guests with the lavishness of the cliff and villa. Enhanced only by the wedding party's varying outfits choices and the floral décor, this cliff wedding is something straight out of a fairy tale and will leave your guests dreaming of this place for years to come. Balian is approximately 2 hours drive away from the areas of Kuta and Seminyak, allowing you to break free from the large throngs of tourists. Privacy and seclusion is paramount for this wedding package, enabling you and your wedding party to feel like you’re the only ones on the island. The landscape for this cliff top wedding is one of not only stunning ocean views but also the rolling rice paddy hills. Greenery, the ocean, cliffs and the hidden elements for additional photos make this as close to perfect as you can get. Combined this makes for a truly luxurious and one of a kind wedding. This package also has some other bonuses, such as a 1 night stay at the villa, a calming traditional Balinese massage and a romantic meal. All of this will take the stress away from you to create a stress free and seamless wedding. Of course, a marriage is special no matter where it is confirmed, but a Bali cliff wedding venue adds an element of luxury, a feeling of wanderlust and exotic. Every detail will be handled so you don't have to fret about anything. Romance, dramatic views and service designed to assist you in every way is what you can expect with ay of these mind blowing cliff wedding venues. Contact the team at [email protected] to find out more!